Love working as a team? Then you’ll love clueQuest: Plan 52. Then look for further as you can play clueQuest’s many escape rooms that has a on-going story from the first room to the last. Love Pop Ups – London went along and played PLAN52 in a top secret location. In PLAN52 something terrible had happened. Four of the agents who were stationed there had vanished without a trace due to the work of a double agent. Mr Q suspected that the evil Professor BlackSheep helped the double agent to cover his tracks. It was up to Love Pop Ups – London team to investigate the risky matter and had to identity who was the double agent. From the moment the team set foot inside PLAN52 they had just 60 Minutes to learn who the double agent was and deactivate the bomb before the entire facility detonated. clueQuest have three escape rooms PLAN52, OperationBlackSheep and Revenge of the Sheep it is best to be played in order as the story starts from PLAN52. 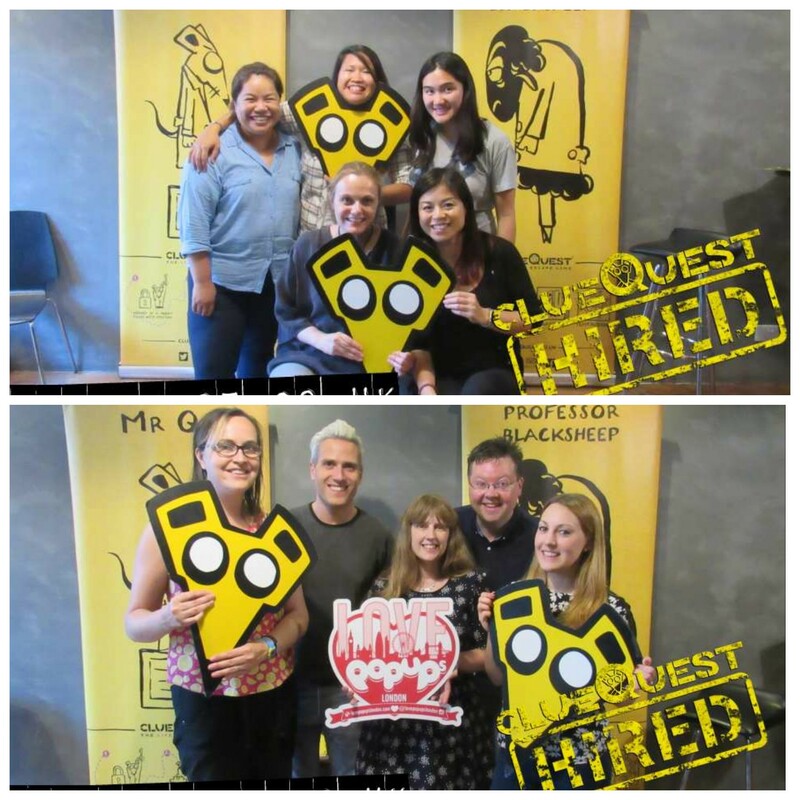 Thank you to clueQuest who let some of us from the community of Love Pop Ups London come down to experience your fun and challenging escape room PLAN52. Read all the blogs/reviews from the comments section below. The name is Q., Mister Q! Now on to the game: We played Mr. Q., not sure if it’s always set-up as such but we were paired in 2 teams and the 1st team to make it out of the room wins (2 rooms with the same tasks to achieve). What I really liked about this room is that it might not have been the hardest I have done but it was complexed enough to make it a challenge and I really liked how everything was flowing. By that I mean that if something seemed not of use it was simply because we were not there yet. It’s really a good team game as there was plenty to do to split up in small group and take on various tasks all at once. I would highly recommend this room whether you are experienced or not as it requires so many different skills that you won’t feel useless or overqualified. I would definitely be back to try the other room! The review can also be found on Yelp! Amazing time at this escape room!!! Yes, another amazing escape room!! Once again I got to go along because of Love Pop Ups-London and hone my skills! There’s a few reasons why this has been my favourite escape rooms in a while. The first reason is just that we made it through with just three hints along the way. I’ve found that many escape rooms are far too generous with their hints, leaving you without a sense of accomplishment. Here though, when we won, I really felt like we had done it on our own. clueQuest is most certainly the best themed and most organised escape game I have been to. With super friendly hosts who are in character as you arrive (and patient when people arrive a little late) and a large, comfy waiting area they are already on to a winner before you even get in the room! Once we were all settled on sofas we were debriefed as new recruits for Mr Q’s crime fighting secret agency and then led in to one of the many rooms containing the amazing custom built props and gadgets. There are in total 3 different games/missions (2-4 identical rooms of each) which get progressively harder and also follows each other in terms of the story line as well. We started at the beginning with mission PLAN52. PLAN52 is the location the secret agents covert operations are run from however before arriving 4 agents had gone missing and a double agent working for Professor Blacksheep was to blame! Mr Q needed our help to investigate and identify the double agent who had reset the security causing it to be wiped in 60 minutes – we also needed to fix that before time ran out. Fortunately we made it out with 3 minutes to spare and had a blast in the process. The puzzles are varied and very clever. The room is decorated brilliantly with plenty of themed props. I won’t say much more however there was lots to do in the 60 minutes and unlike other games I’ve been to there were only a few clues given so we left with a real sense of achievement. At the end the hosts kindly explained any puzzles that had left us… well puzzled, as well as taking a group photo and printing us each a copy. A massive thank you to Love Pop Ups London and clueQuest for inviting me to experience it. I highly recommend if you’re looking for a fun team experience in central london (they’re based in Caledonian Road!) but watch out because of the running story you’ll be dying to do all 3 – I certainly am! Love Escape Rooms? Love one that your team of 5 can do and no one feels that they are not watching the action due to not enough to do in said room? The clueQuest’s Plan 52 is the one for you. I went along to play game PLAN52 via Love Popups London and wow did I have so much fun!I was with 9 other people from Love Pop Ups – London and we were split into two teams. We went to the room and the timer started counting down, and immediately our team went to work. I kept waiting for a hint or a clue to pop up but none did. All the puzzles were quite challenging, and there were so many locks to lodge but for some reason our group have complementary skill sets. I would start a task and then get stuck, and another member would help out, and I’d finish it off. All the puzzles were so creative and there was definitely so much variety in there. We solved the challenge with 7min 53 secs to spare and NO CLUES! This was really an amazing feat and I couldn’t help smiling and gloating all the way home. clueQuest is a bit different to other escape rooms, because the waiting room felt so relaxed and it was not crowded. Your game master also told you the different locks and how to open the locks when you have the code. I found this extremely helpful because I’ve had trouble with locks in previous escape rooms. However, this time, I’d just ask someone else to open the lock if I couldn’t and I was sure about the code. I also like the fact you got to doodle in their guest book and print the team photo in there like a scrap book. No clue teams get their photos printed on a magnet so it’s currently stuck to my oven at the moment. Time for more escaping, this time we headed to clueQuest and attempted the first challenge PLAN52. Two teams head to head. Located just along the Caledonian Road near Kings Cross, I was quite pleasantly surprised at how good clueQuest actually was! From the moment you enter into the waiting area (with zany yellow and black chevron decor dotted around the walls and with one side looking like a living room and the other side a more table and chairs approach to wait until you enter your game with big books to write in your team name along with a team photo and yes you can doodle and draw to win a prize on your team page). Now onto to our game, we were first told the story of why we had 60 mins to escape and a health a safety briefing and instructions on how to open the various padlocks we would come across during our escape which I thought was good. Now I’ve done quite a few escape rooms lately and again this one has to be another one of my favourites as from the moment we entered the room everyone was identifying objects and working on clues which is what I like! now I can’t say much more about clueQuest without giving away too much or it will spoil your experience, so if you want a great team night out (a team of 5 is perfect in my opinion for this event) then look no further. Also at the end of the game, a team photo is done as per usual and if you have completed the game without any hints during your game, then not only do you get a team photo each to keep you also you get your very own fridge magnet version!. clueQuest will give you and your friends an evening of fun if you like escape rooms. Go on what you waiting for? I know you want to book it! Thank you Love Pop Ups – London and clueQuest for the fun experience. I got slightly lost looking for clueQuest as it doesn’t have a hugely obvious sign. But once inside, it looked like it was going to be a fun afternoon. There were large banners up of Mr Q and Black sheep and you learn they are up to naughty things when you are given your induction, hence it’s down to you and your team mates to stop their plan and save the day! I’m not sure what the maximum group size is but we had five in our team. Without giving away too much, I can tell you that there are two rooms per game and each room has lots of little tasks that you and your team need to solve in order to get through each room so you can escape. If you struggle like crazy, a member of the team can give you little clues via the walkie talkie so don’t get too worried if you are stuck. We finished our game with just under 8 minutes to spare and no hints were given. Apparently the quickest a team has ever finished the game was in around half an hour…! Thanks to love pop ups and cluequest for organising this so we could try it out. Haven’t done this room but have completed all their other rooms. Good briefing and love the fact at the end they take a team photo and allow you to leave with a momento of your time with them. If your lucky enough to complete a room with no hints you’ll get a nice fridge magnet as your reward. Nice solid room to start with if your a beginner in the escape room craze. Has a nice set of puzzles and requires logical thinking in order to solve them. First time I’ve my request for a hint has been denied games master as we were doing so well! You will not solve this if you do not work as a team and fail communicate what you have found to others. It is essential that you put all elements together in order to solve the final piece to leave the room. Good for a team day out! Definitely recommended for beginners if your looking for a good time and something fun. Thanks you love pops up and clueQuest – I now have completed the full set of rooms here! Look forward to your next one in the Winter!! On a wet Wednesday evening, I walked the 10 mins from Kings Cross station ready to take on the PLAN52 escape room from clueQuest. The waiting area is large which makes sense considering the number of rooms (they have at least 2 versions of each of the three rooms they have – so perfect for work team building events or large parties). Once the 5 of us were ready to play, the games master explained our mission and the ground rules (given that the waiting room was full and games starting at roughly the same time, this bit was a bit difficult to hear). Our mission: we’re secret agents; our boss is Mr. Q and he needs our help identifying the double agent in our midst and stopping the facility from self destructing. Communication is key for this room, as there are numerous locks and items, and you need to keep track of what clues have been used and what’s still outstanding. You don’t need any outside knowledge or to be superhuman and there’s enough puzzles for everyone to be working on something. I enjoyed the flow of puzzles, not all were linear and uses for items found earlier in the game were soon revealed. We had the satisfaction of escaping with 4 mins 46secs (I think) to spare, and only 1 hint needed! They have a camera and mini printer so everyone can get a little team photo (that can also be put into a fridge magnet). I can’t wait to try the remaining rooms they have, and the completely new rooms they have! Many thanks to my team, clueQuest and lovepopupslondon! Who doesn’t want to be James Bond and save the world?! Really enjoyed clueQuest and found PLAN52 to be challenging for the entire team, we escaped with just minutes to spare. It’s the perfect activity for a rainy London day. clueQuest are well organised and have the process running smoothly. Suitable for all ages, a great fun day with friends and bonding activity for work colleagues. I’d happily return.